An update on the Northeast Washington Forestry Coalition from our Forest Field Program. While divisiveness grows rampant in many parts of the world, there’s still a place in the northeastern corner of Washington state where those of different viewpoints work together to promote each other’s interests to the benefit of all. This forum is the Northeast Washington Forestry Coalition or NEWFC, a collaborative formed of various interest groups who have come together with the intention to agree, find balance, and support high-quality habitat restoration projects and wildland protection on the Colville National Forest. As a NEWFC board member since 2004, Conservation Northwest works with other participants from the timber industry, forestry consulting firms, outdoor recreation and environmental groups to demonstrate the full potential of restoration forestry and conservation actions to enhance forest health, wildlife habitat, public safety, and community economic vitality. 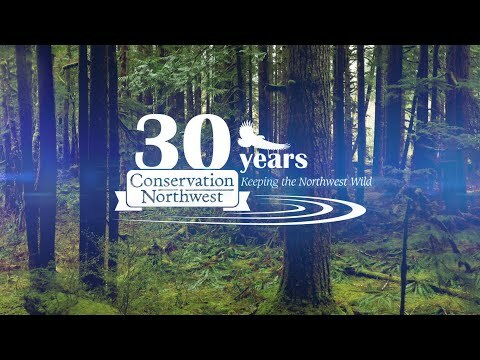 Conservation Northwest was one of the first regional conservation groups to recognize the value of ecological forest restoration and community collaboration. Through our Forest Field Program, we advance these tools to help restore and protect forests, rivers, and other wildlands while also promoting sustainable forestry and benefiting local communities. In addition to my work on the Colville National Forest, we maintain forest staffers for the Mount Baker-Snoqualmie and Okanogan-Wenatchee national forests. Under our Forest Field Program, we engage on specific projects as they are proposed, apply our field experience to shape broader policies that affect the national forest and wildlife habitat, and engage collaboratively with other stakeholders to promote landscape-scale restoration of forests and watersheds. Being a part of NEWFC and other forest collaboratives means commitment to our fellow members, and genuine respect for their values. Members strive to base their discussions on shared interests rather than individual positions. We reach agreements through consensus so that when someone disagrees, we ask, “What will it take for you to agree?” In essence, we support the economic objectives of our timber industry partners, while they support our conservation objectives of wilderness protection and restoration-based forest and watershed management. We all want to sustain the forest for the future. By focusing on outcomes and common-ground, we are usually able to reach consensus. Within NEWFC, Conservation Northwest provides active guidance as a board member and as the co-chair for the Adaptive Management Committee, where local projects, local, regional and national policy changes and management tools, and guiding principles are processed before bringing a recommendation to the whole board. In the interest of both people and wildlife, we advocate for restoration-based forest management, using scientific literature and experts to guide and support our recommendations for the collaborative’s position. We review new Congressional authorities to recommend when, where, and if they are appropriate for use on the Colville National Forest. We have discussed and informed the guiding document on the Colville National Forest, the Colville Forest Plan, including its recommendations for old-growth forests and aquatic protections, roadless areas and wilderness recommendations, and other wildlands protections for the Kettle Crest and Columbia Highlands—cherished areas for our organization and conservation community. We also advise and guide the development of restoration projects to improve forest health, increasingly important for not just wildlife, but also to ensure natural fires continue to deliver desirable ecological outcomes. Our Forest Field Program staff and partners on field tour. Forest collaboratives support both healthy forests and local economies. This model of balance works for conservation in both the short and long terms. When the 35,500 acre Stickpin Fire in the Kettle River Mountain Range changed the conditions of the Orient restoration project in 2015, NEWFC did the smart thing and asked the Colville National Forest to update its landscape evaluation for the project. With an updated analysis of the project area, they were able to determine both positive and negative effects of the Stickpin Fire. The landscape evaluation told us that in some places, the fire did positive work—killing small trees and thinning areas that had overgrown after decades of fire suppression—therefore restoration work was adjusted accordingly. However, in other areas where small dense trees called ladder fuels abutted large, mature trees, the fire killed those large and old trees, strengthening the argument for the protection of those remaining. With this agreement, the project was able to move forward after a significant disturbance with its goal of forest restoration. The conservation and restoration work in the managed areas of the Colville National Forest improves conditions on the ground and promotes resiliency in anticipation of a changing climate all while providing rural economic security for the communities and timber industries we work with as a byproduct. It also sets a framework for collaborative decision-making that supports balance between working forests and wilderness protection in northeast Washington and beyond. We’re excited to continue our work with NEWFC, keeping Northwest forests wild and healthy for people and wildlife! Learn more about our Forest Field Program, a flagship program since our founding.